The appointment starts with a consultation from your Chem-Dry of Brazos County technician. He will explain our process, identify potential problem areas and provide recommended solutions before moving forward with the deep cleaning service. Next, it’s time for our technician to apply The Natural to the carpet. The Natural is our proprietary cleaning solution and the signature element of our green-certified service. The Natural is chemical-free and creates millions of tiny bubbles that lift embedded dirt to the surface of your carpet. Our service features Hot Carbonating Extraction carpet cleaning, or HCE. HCE has several industry recommendations and provides a deep clean for your carpet. Our high-powered extraction equipment uses hoses and suction to remove all of the dirt, allergens and bacteria from your carpet and transfer it to our industrial disposal tanks. That’s it! We then rake the carpet fibers, clean up our equipment and leave you to a cleaner, healthier home! Most appointments require no longer than one or two hours and your carpet should dry not long after we leave, typically within just a couple of hours. 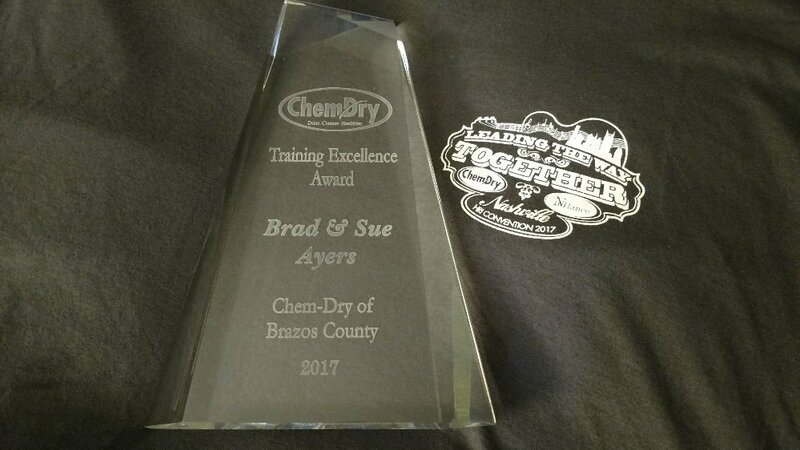 Chem-Dry of Brazos County cleans for businesses too! We are proud to provide local businesses commercial carpet cleaning services that are healthier for their customers and employees. We offer flexible scheduling to accommodate your business hours. Call (979) 776-9833 for information on pricing. Powerful cleaning process to remove embedded germs and bacteria from porous grout and tile floors. 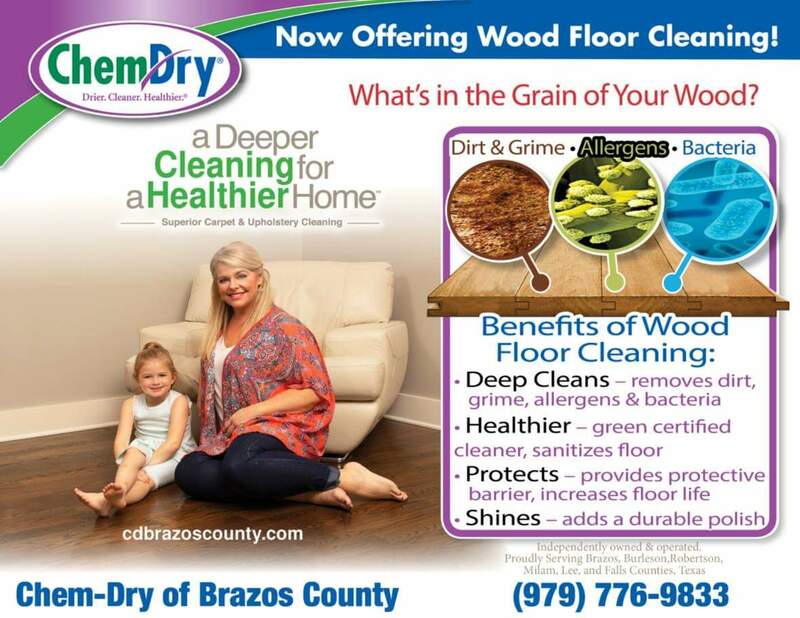 Chem-Dry of Brazos County specializes in deep cleaning for wood floors to remove allergens. Our granite countertop renewal service removes germs and bacteria from countertops and restores shine. Our polishing and refinishing service restores the natural shine of your home’s stone flooring. Impressed with their professionalism and service. I was amazed at how clean the carpets got. We strive to be the best. Thank you for leaving a review for us. We have been customers for nearly a decade and will not use anyone else. They have always done a wonderful job. We have had them clean carpets, rugs, upholstery, and tile. They are honest and caring and extremely knowledgeable. Thank you. We try to make sure everything is done right the first time. Its always a pleasure visiting with you. 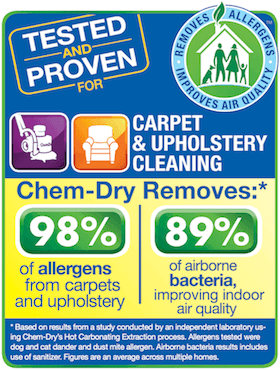 Chem-Dry did a fantastic job on our carpets. They were professional, timely, and remarkably efficient. We tackle the tough jobs others can't. Thank you for leaving a review. Sue does a great job and very professional! Thank you. 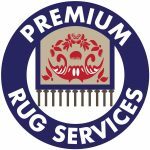 We are only a couple shops in town that have a dedicated rug cleaning facility. Thank you for trusting us with your cleaning needs. We had been contemplating rather we should just replace our carpet or not. They came in and cleaned it and it looks like new. We will be using them again in the near future!